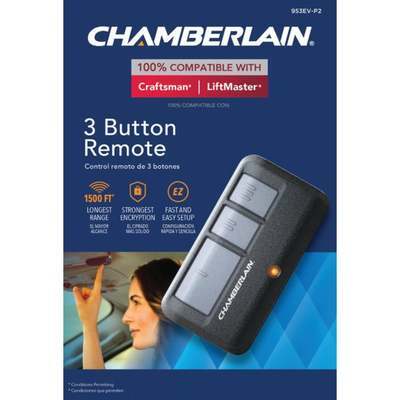 Most popular Chamberlain remote. Versatile 3-button design is perfect for in-vehicle use. Works with all Chamberlain openers from 1993 to present. (Any Chamberlain opener with Safety Sensors). Signal reaches from greater distances. Secure coded signal cannot be hacked. LED notification light signals activation and helps with programming. Easy push-button programming, sets up in minutes. Includes battery and vehicle visor clip.